The Sacramento Bee today confirmed that Jeff Holden, fourteen year General Manager of Clear Channel Sacramento, is summarily being replaced by radio veteran Dave Milner. The article gave no real reasons for the dismissal. It is interesting to note, however, that it came just four days after the Media Action Center published a detailed report on its meeting with Sacramento Media Group, Occupy Sacramento, and Clear Channel execs Holden and Alan Eisenson. 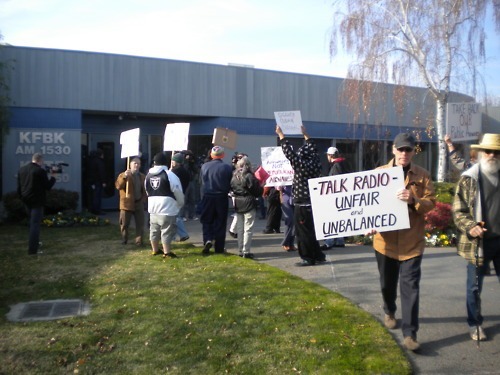 The meeting, held February 6th, followed an Occupy Clear Channel public files inspection action, and was to air community grievances to Clear Channel about its one sided political programming, especially during an election year. During the meeting, Holden agreed to provide a response to our concerns in writing; after nearly two months, and after being pushed hard by meeting participants, Holden reneged on that promise. So the report reflects the detailed notes taken by participants (including yours truly) during the meeting. "Regarding putting some progressive viewpoints on at least one of the six stations under Clear Channel's management in Sacramento: 'CCS said they'd been trying to find suitable progressive programming, but were unable to find any. 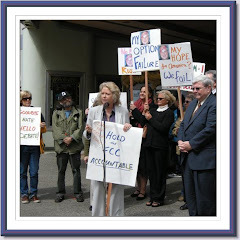 Our suggestions of highly rated talkers like Ed Schultz, Thom Hartmann and Stephanie Miller were quickly dismissed.'" "Regarding our concern that in the upcoming Presidential election, there would be 9 prime time hours per day - on each of their 3 talk stations (KFBK (AM & FM) and KSTE) - of talk programming effectively promoting the Republican candidates and issues, with zero hours – or minutes – of promotion of alternative candidates and viewpoints. CCS management said they were fine with that, and defended their position saying they were very good at conservative radio, why would they change?" Could it be that this report is embarrassing to Clear Channel? One can only hope.